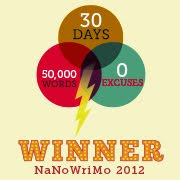 There are any number of excuses reasons I haven’t been blogging much, recently. I’d like to say it’s because I’ve been busy though that only accounts for part of the time. Mostly it’s because of a generally procrastinacious streak that has been getting worse – not that I was ever anticrastination, myself. But recently, I’ve been reading a little of Henry-Louis de La Grange’s first volume (the 1973 edition) of his epic Mahler biography – managing some 200 pages and skimming another 100 or so before the book was due back to the library (being an interlibrary loan, the renewal policy is fairly limited). The trio is basically a four-movement work in one movement, except in this case, the movements are cut up and spliced into the continuous fabric in various segments so that before one movement is finished, the next movement has begun and it may be a while till we get back to that point of departure. Consequently, this has involved a good deal of planning to balance the symmetries and proportions of the form this creates. The major problem this past month has been working out the second movement which is a chaconne, similar to the one that formed the central arch of a five-movement violin sonata. I’ve never been a big fan of the “sectional” variation form – thirty-two variations mostly in the same key and all, basically, the same form (say, “rounded binary”) one after the other, regardless of the amount of variety the composer can squeeze out of often very insipid material. While I love, say, Brahms’ “Variations and Fugue on a Theme by Handel” (something I actually could play, once upon a time), there have been few performances or recordings of it that didn’t strike me as the equivalent of Chinese water torture on the macro-structural level. And chaconnes are basically the same kind of thing – a chord progression that repeats over and over while something noodles around above it. (The passacaglia, close cousin to the chaconne, can have similar issues.) There are very few that can hold my interest after a while. So my idea (which I’m sure is not original) was to come up with a chord progression that can modulate which means that, rather than having 32 variations (or 512 measures) all in the key of, say, D Minor, it can actually have a continuously varying tonal palette. By the way, I should point out two exceptions to this problem (at least for me) and both are by Bach: the Chaconne in D Minor for solo violin from the Partita No. 2 (which I used to play in Brahms’ transcription for piano, left hand which I originally took on when my tendonitis was acting up) and the Goldberg Variations which are not only sectional variations but also based on a repeating harmonic progression. The difference is, you’re never hit over the head with the idea "this is the same thing, over and over again." Anyway, I set up a series of chords that have a logical harmonic direction but which can also evolve in different ways. By carefully crafting the tension between dissonant three-note chords and standard (but not standardly used) major and minor triads, I created a pattern of chords that point to certain resolutions, thereby moving from one “tonal level” to another as the piece unfolds. And a lot of this can be varied simply by using different inversions of these chords: in certain instances, a three-note (non-major/minor) chord could go off in a different direction in a different inversion; a close-position chord could have more tension than the same one in an open-position. A second inversion major triad will have a different sense of resolution than a first inversion or root position triad. By using these chords in a consistent manner, you can create your own harmonic context of dissonance and resolution. Above this – as in a traditional chaconne – would be a melodic layer, something that rises out of the chord progression and changes continuously or may, in itself, become the source of variations. Only in my case, this layer becomes more independent until it seems to have no relationship to the harmonic layer. In fact, the sense of line cadences at different points from the harmonic layer, only merging at certain significant points. This creates a kind of temporal counterpoint that still fits “logically” within the harmonic and melodic expectations. Whether a listener senses this “logic” is not the point but it helps underline a hopefully emotional response to the idea of what a cadence – whether it’s by Bach, Beethoven or Schoenberg – can be (or should be, if the performer is at all aware of the emotional nature of what’s happening in the music). Getting these two lines to work together was not a matter of just slapping notes down on a page (usually too often the way “modern composers” in any era are accused of working). There was still a context that needed to work harmonically as well as linearly, just like it did in all those counterpoint exercises I should have done when I was a student but usually didn’t because counterpoint in general was something generally overlooked). Now, in a piano trio, there are so many ways you can subdivide the instruments. If my harmony is based on three-note chords, two string instruments cannot always be playing three notes, so they must be carefully worked out in such a way that this is possible. Also, having the melody in the piano meant it was either doubled in both hands or I had to work out some kind of “accompanimental line” so the texture wasn’t so spare but then this became another layer of complexity to work (contrapuntally) with the harmony and the melody. There were days I just stared at blank pieces of paper, scratching out potentialities, only to sit back and think, “ya know, this would be a lot easier if it were for orchestra” – as if having more instrumental options made the instrumental challenges less challenging. Or “maybe it would be easier if I just started over and did something else.” Or “perhaps tomorrow will be better,” and I’d put it aside. So now I’m ready to start the first segment of the third movement, a scherzo, and probably the same thing will happen – I need to sketch out the whole movement, not just the portion of I need at the moment. Besides, it overlaps with the other segments as if fading in and out of our perception, so all of that has to be worked out in advance. It’s not whether these are first, second or third movements, because they will appear in various orders at various times. In fact, the Trio ends not with the fourth movement but with the final segment of the first movement which is, essentially, the recapitulation of the opening, however affected it becomes by everything that’s happened in between. But each movement is definable (easily recognizable) by its mood or tempo – or, in the case of the chaconne, its “procedure” – not by its location in the time-line. The scherzo is fast, the last movement to be introduced (if not the finale) is actually a slow (by comparison almost suspended) nocturne-like movement. Yet the tempo throughout is the same – the metronome set at a consistent “quarter note = 60” (the silent common denominator of a ticking clock) while the perception of the tempo frequently shifts by the number of notes we hear in a given pulse. This creates something not nearly as complicated looking as Elliott Carter's 7-against-13 passages or metronome markings like 163.3 or Leon Kirchner's Piano Trio II which has six metronome changes in the first ten measures. Well, anyway, time to get back to work. 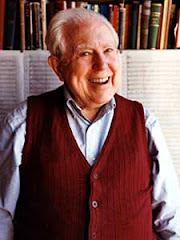 Elliott Carter’s 103rd Birthday may be less than six months away – is it more cumbersome to refer to someone as 102½? – and even though he is writing less than he’s been in the past few years (there was a veritable flood of new works leading up to his 100th birthday), he is still composing even if they’re “short” works. But what Carter packs into a piece in ten minutes can still make a major statement. There have been two recent premieres of works composed in 2010 and both with orchestra – which means there are a lot of details involved, more than writing short pieces for just a few instruments. You can read Joe Barron’s account of the Concertino for Bass Clarinet & Orchestra, receiving its American premiere in New York City earlier this month (it received its world premiere in Toronto last November). 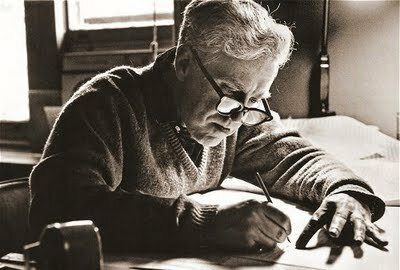 There is also another work for soloists and chamber orchestra that was premiered on June 26th, just two days ago, at the Aldeburgh Festival in England, a work they commissioned and the third recent work they’ve premiered. The review in the Guardian, posted yesterday, refers to the double concerto for piano, percussion and a chamber orchestra of 20 players as “Dialogues” which is confusing, since Carter called a 2003 work for piano and orchestra written for Daniel Barenboim “Dialogues” (and there is a “Dialogues II” in the works, for Barenboim, as well). The Boosey & Hawkes website refers to this new work as “Conversations” (close but no cigar). This review, posted at the Telegraph (which contains a generic you-tube video interview with Carter), gets the name right. Incidentally, Mr. Barron has also initiated a Facebook Campaign to get Elliott Carter to host Saturday Night Live.